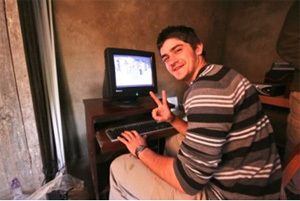 In February 2008, University of New South Wales (UNSW) 14 photovoltaic engineering students along with one professor Alistair Sproul participated in installing the large solar home system in remote school of Nepal. The major project undertaken in February 2008 involved installing PV systems in a high school at Borlang-7, a small village about 3 hours bus ride out of Gorkha. This was carried out by a team of engineering students from UNSW. The high school has about 500 students. 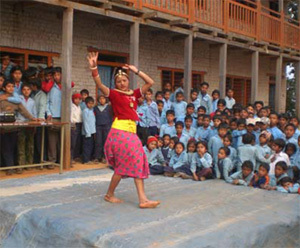 Like many Nepalese high schools well away from the major cities, only about half the funding required to run the school is provided by the government, the remainder of the budget has to be found locally. The PV system for powering the computers consisted of four PV panels in parallel (87 W, Kyocera, KC85T). These were roof mounted facing due south at tilt angle of 30° (Fig. 7). Due to the latitude of most of Nepal being ~28° N, a tilt angle of 30° is commonly used. The monsoonal influence on the solar irradiation would actually push optimal tilt angles lower but this is not standard practice and so was not implemented at Borlang-7. The batteries for the computer system consisted of four Trojan, deep cycle 100 Ah batteries in parallel and were charged via a Steca PR3030 charge controller, capable of handling 30 A (Fig. 8). Two smaller PV panels (Kyocera, 40 W) were installed with their own charge controller (Sundaya) and flooded lead acid battery (Volta 95 Ah ), which are connected to twelve 11 W fluorescent lights in 4 classrooms, the staff room, the battery room and the Principal’s office. Shown in Figure 7 is the completed installation of the charge controllers and batteries in the battery room. On the left hand side of the picture, the 600 W inverter can also be seen. This provided AC power for the computers. The UNSW teams were warmly welcomed and farewelled by the villages of Shanke and Borlang-7. Not many of us have ever experienced anything uite like that before in our lives! On behalf of all the UNSW team members we would like to thank the communities of both Sankhe and Borlang-7 for their wonderful hospitality, for their cultural programs of singing and dancing and for the wonderful meals that you provided for us. Special thanks to Dr Vanu Poudel and everyone involved with the Sankhe project. Also special thanks to Mr. Mukti Dhakal (Principal, Shree Jageshwor Secondary School) and everyone involved with the project at Borlang-7. For all of us who were involved in the projects we will always have many wonderful memories of the people we met and worked with. Solar Electricyt products has been given to the Villagers of Baglung District. The villagers are so happy to got this products. Their children can study on light now a days. 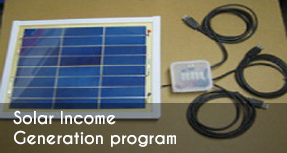 Solar Electricyt products has been given to the Villagers of Baglung District. The villagers are so happy to got this products. Their children can study on light now a days. The solar panel products has been given to the villagers of Baglung District. This type of product can produce electricity. With the help of solar panel they can watch TV, listen radio etc. The villagers are so happy to get that type of products on their house. 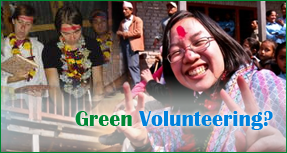 One week of renewable energy program was finished on the village of Baglung. In that programme there are more than 20 village participating on that programme.